Today, I am going to be on a roll again with my postings. This time I would be sharing with you on some really reliable products from Althea that could help get rid of the acne and pimple problems that you are facing. As you know by now, if you have been reading my previous posts, I had a major breakout since last December and had been dealing with it till somewhere last month. At first, Tammy did not want to risk 'agitating' my skin problems any further when I asked if I could review the Trouble Breaker Box from Althea a month plus ago. However, after I insisted on giving it a try, I am nowhere near regretting my decision! In fact, I would highly recommend to you, if you are having skin problems to try this two products, The Saem Healing Tea Garden and Innisfree Bija Trouble Lotion out because these really helped me the most to get the almost to flawless skin that I have now within just a month. Even on the first night that I used the Innesfree Bija Trouble Lotion, I kid you not, I had two huge pimple bumps on my face and it subsided the very next morning. One of it went completely missing too. No, no, I am really not exaggerating. This is me being honest with my review. Since it works so well for me, I decided to give a little portion of the lotion for my boyfriend to try it out too, because he is also battling acne. Please note, that I do not use this product under makeup, I only use it once a day before I head to bed. And the results were already impressive, IMO. Previously, I used another makeup cleanser, but I am most definitely sticking to The Saem Healing Tea Garden Tea Tree Cleansing Water after this simply because I realised it helps to clear off my makeup effortlessly. On top of that, I do feel like it calms my face down a lot, probably because of the light ointment-like scent. Honestly, there are days that I just use this just to cleanse my face either early in the morning or night before I sleep. And I don't have to worry about any breakouts. 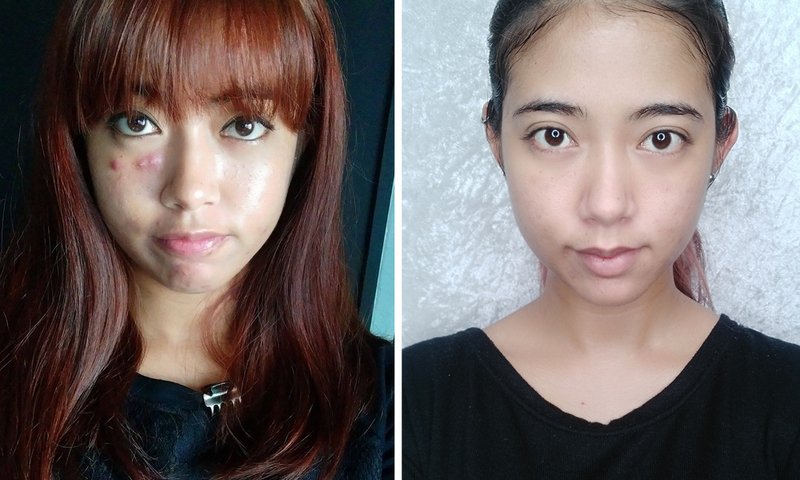 This is how my face looks like now in comparison to how it looked two months ago. Next is the A.C Control Care Skin Toner, which really helps to refresh my skin. It has this botanical scent to it and it's highly moisturising. Needless to say, my skin tone has also balanced out over the weeks of using it. Probably, the only reason why my skin tone hasn't been as balanced as I would like to be is that I am not being consistent enough with using this toner. If you are the kind of person that like to treat only specific areas on your face, then this Aromatica SOS 53 Blemish Spot is perfect for you. You don't need a huge amount of this, just use the cotton swabs that it comes with, soak it and simply dab on top of the trouble areas. So far, I have used this for the smaller pimples, as I stopped having breakouts after using the Bija Trouble Lotion, and it works perfectly. It also doesn't make my skin oily, so that's a plus point. And like the lotion, I only use this at night before I sleep. Because I feel like it kind of beats the purpose of treating and healing if I am going to put on makeup and trap dirt. One thing that I learned from this Trouble Breaker Box is that one of the most crucial ways of treating pimples and acnes is to keep your face hydrated and cool as much as you can. That's when having the Icy White Aesthetic Cooling Self Skin Massager comes in handy. Initially, I thought this was a cream, silly me. Then only after reading a few more times on the product, I realise this is like a cooling pack, but instead of a pack, it's a cartridge-like tool that helps to cool down your skin. This really soothes the skin especially when I am wearing a sheet mask and I slowly massage my face with this product. The feeling is super nice, really! Oh, and as a bonus, you could actually also use this when you are having a fever. Hahaha, how cool is that? Pun intended. Lastly, is the Missha Speedy Solution Anti Trouble Patch, which pretty much works like your regular acne patch. Probably, the only thing that will make me want to buy this patch again is that it's very light, thin and can be easily covered with makeup. Though, I personally prefer not to wear a patch (from any brand, actually) because I feel, for me, that it makes my face produce more oil. So, I avoid using patches. 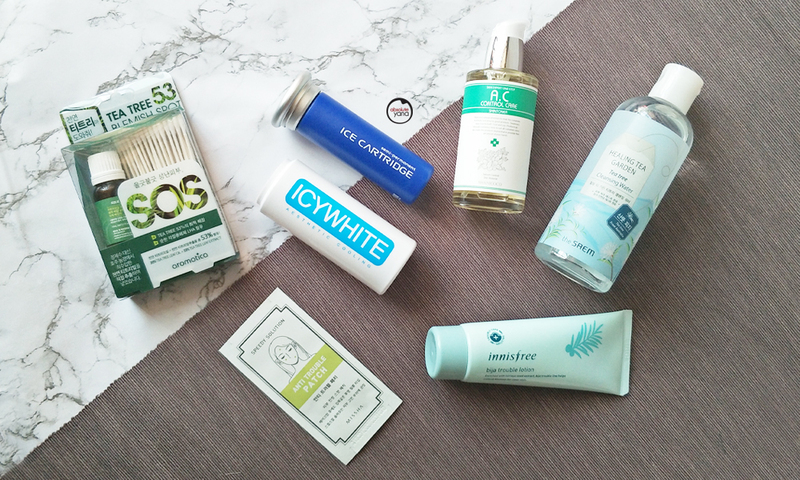 You should try some of this products as it can really help to battle those acne problems. Obviously, I am not saying that with these products your face will be completely pimple free, it's just that it will help you to keep your pimples at bay and not popping out parties on your face. No one can escape pimple invasion if you keep eating oily food and stressing out over every single detail in life. So do practice a healthy and stress-free lifestyle. Let me know in the comment box below which product would you give a try or has any of these work (or not) for you. Wow.. Tq for sharing.. Nice one.. Will try soon..
Great for you that you have managed to find the one for your face. And thanks fo Althea for bringing all the great items to our shore. Oh Yana I could feel your sentiment. There are time I have that bitchy acne on my face (and even got it whenever I have scheduled event, which is more bitchy!) and hiding it is a struggle. Glad these babies work with your skin type. I will list them down and try it too. That looks like a fabulous change in skin texture. I love using tea tree cleansing water. Love the Tea Tree Cleansing Water too. That box really safe you, Pretty! that's a great healing! great testimonial u have! What a big difference, will recommend this to my friend in need. Oh my! So huge difference.. It really does all the rescue and healing works!!! Amazing! Tea Tree Oil is definitely a multi purposes SOS for skin. Waaahhhhhhhhhhhhhhhh bagusnya! Testimoni bagus ni. Bila kulit dah cantik, baru lah happy kan. I can see the changes. Your skin getting better. Thanks for recommend this box. I'm gonna purchase Innisfree Bija Trouble Lotion after reading your review. This product make it already! Your amazing result if before and after proved that it works! Wow, impressive. I've got a huge bump on the side of my face currently. I forced it to break after the longest time and now my skin is bruised and I have to wait for it to recover. Ah, luckily can cover with my hair. Let me try these products and hope they work as well for me. OMG the result is thrilling and significant! Your skin turns so much better now! OMG Tana I bet it takes courage to post the before photo. But I'm glad that this box rescue and recover your face in such effective and beautiful way. When I see you, I can't imagine your face have this breakout before! wow.. berbeza sangat.. now u look more comel than before! muah! Oh wow.. this is really good, after that spate of bad skin days.. you look like the fabulous you with Althea's products!!!! Definitely Daebak!!!! Wow your pimples are really huge, glad that the products woerk well on yr skin.